On January 20th, 2014 Matt Cutts, head of Google's Web Spam team, came out with a post that rocked the SEO industry. It changed each and every guest posting guide for ever. 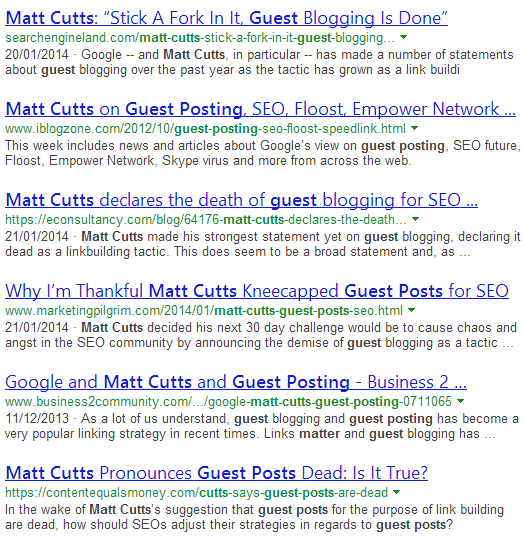 If you can't tell from the title, Matt essentially pronounced guest blogging as dead. And then the storm came i.e a hundred follow up articles from prominent blogs on how guest blogging was now dead. You don't guest post for links. You guest post for traffic and authority. And now, four months later, guest posting as a strategy to get traffic is still very much alive and kicking. Take a look around - guest posting is happening all the time. Just the other day, I saw a guest post from prominent blogger Noah Kagan of OKdork on Sean Ogle's blog. And I thought to myself, if a man who created not one but TWO multi-million dollar companies and grew an email list of 700,000 people, is willing to sit down and write a guest post, then it's probably a worthwhile endeavor for mere mortals like the rest of us. And so it is - consider the following case studies from "mere mortals". Case Study 1: Sumitha Bhandarkar, owner of AFineParent.com, amassed an email list of over 1,300 email addresses before her blog even launched - entirely through guest posting. Case Study 2: Brian Harris, received over 1700 visits and over 200 subscribers (an overall conversion rate of 12%) from a single guest post on OKdork. 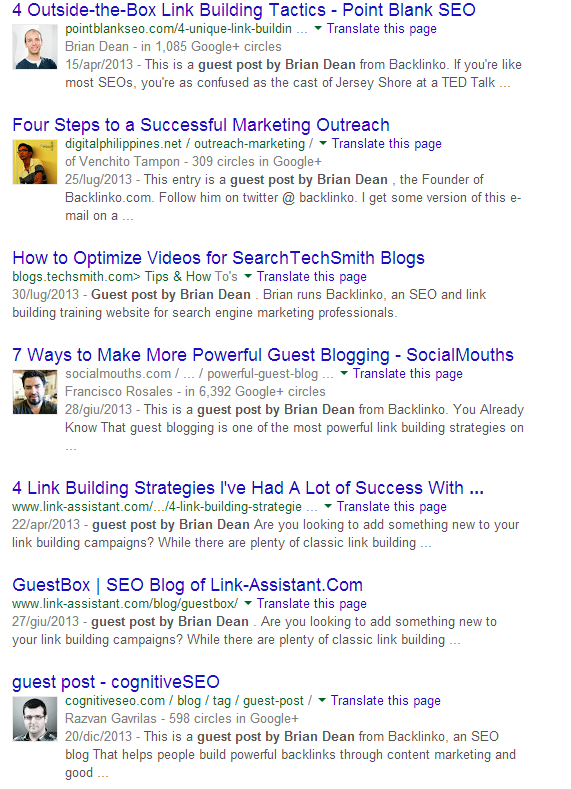 Longevity - Long term, evergreen traffic from having a permanent guest post on a prominent blog. 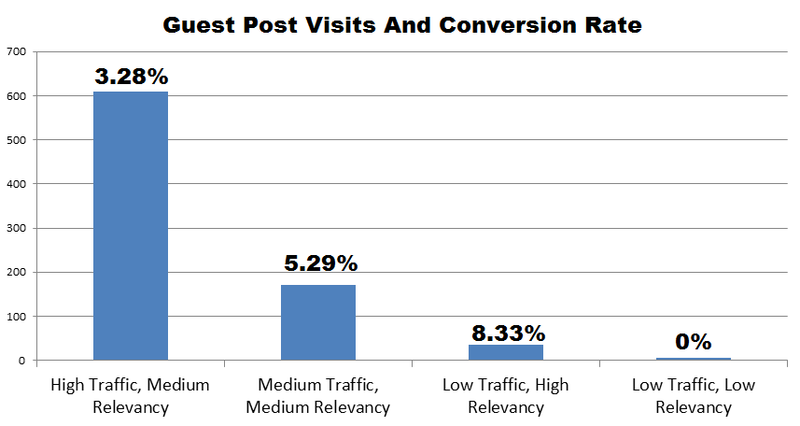 A guest post done right will send traffic your way for months, even years. Branding - Being able to cite your feature as a means to convey social authority. This will allow you to get more features down the line. Growth - In addition to subscribers you'll get social media followers, commenters, and clients, which will grow your following even more. They don't understand what makes for a quality blog to guest post on. They don't know how to find guest blogging opportunities. They don't know how to properly pitch to an authority figure. The number one problem with guest posting is that people neglect to secure both of these, and as a result they don't see the results they should. Even worse, they’re likely to get discouraged, because the amount of time it takes to put together a quality post does not change based on the intended blog’s metric. So we have to be smart, and hone in on the sweet spot. Here are real numbers from my own guest posting on 4 blogs. As you can see, the key is getting high relevancy AND high traffic. What does high traffic mean? I say aim for 10k unique visitors a month, minimum. This can be a bit difficult to estimate when you don’t know the person’s traffic, so let’s call it a Global Alexa rank less of than 50,000. This is around how much the blog on the very left had, and it has sent 600 visitors to my blog thus far. For the amount of time it takes to put together a quality post, I would avoid going below this. As for relevancy, you have to judge that for yourself, but it should be quite clear. Really, if you take the time to look around, you will see that there are more than enough top notch blogs accepting guest posts at this level - it's just that most people don't know how to find them. 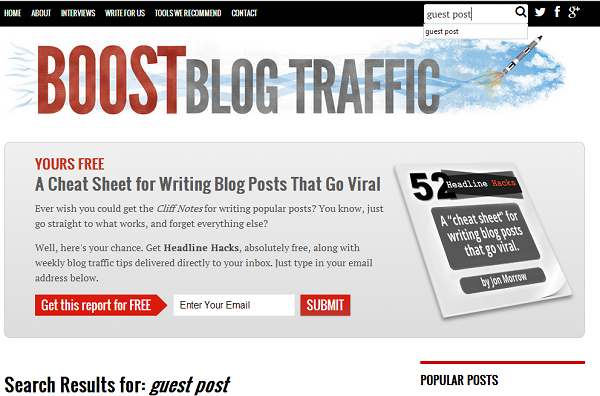 Guest blogging starts first and foremost with finding potential blogs to guest post on. There are so many blogs that accept guest posts, so that isn’t really an issue. The issue is finding quality, relevant sites that are going to send me tons of traffic. Well, it doesn’t start with doing a google search with some operator + “guest post” or random searches in content aggregator sites. We all have those blogs in our niche that we just know are top-notch and would love to get a guest post on. Brian Dean, in his post Blogger Outreach: How to Get Influencers to Promote Your Content for Free talked about creating a spreadsheet of influencers. Does this blog accept guest posts? So let's go and add that. Filling it in is relatively easy. 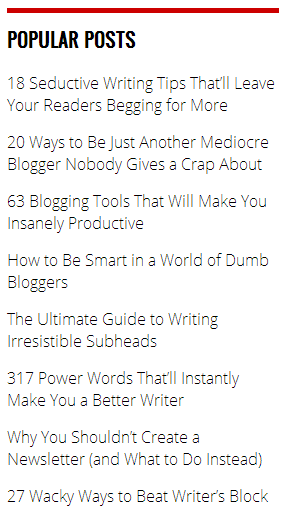 If we follow these blogs, we probably know whether or not they've ever featured another blogger. If yes, there's our opportunity. If you're not sure, there are a few ways to hack it. If we head over and search for "guest post" on Boost Blog Traffic, we can see in a matter of seconds that there are several guest posts featured. As most blogs have a search bar, this make it's very easy. If the search bar option isn't available, check to see if the website has guidelines. These are generally labeled "Guest Post" or "Write For Us"
A quick scan of the home page on Boost Blog Traffic reveals this Write For Us page. NOTE: Even if you're successful with the search bar, it's still important to check to see if there are guidelines as I will show you later. If you find a page like this, be sure to add a link to it in the spreadsheet for future reference. This is sort of a combination of steps one and two. We're going to try to see if we can find instances of a respected blogger guest posting. Usually, we can just do some searches around his name, or perhaps "guest post by". Everytime we see a website that is not their own, we can open it and take a look. This is by far my favorite method, because it doesn’t involve reinventing the wheel. I’d rather let another blogger do the heavy lifting for me and then just pick the ones I like. Looks like Brian's been pretty busy, huh? Scroll through a few pages and we'll have a nice bunch of blogs that are all eligible for guest posting. Additionally, we know Brian's done his research, so he's helped us weed out non quality guest posting opportunities plus given us a bunch of guest post topics to peruse. Option 3: Be On The Look Out For "As Seen On"
A lot of people mention where they've been featured. Pay attention to bloggers' sidebars and home pages and you'll see mentions of other blogs that are potential guest post opportunities. In some instances these are clickable links so you can see exactly what they are referencing. Again, we know the sites here are quality because people are showcasing on their websites. You don’t see Forbes.com next to a no name now do you? If all of that looks like a lot of work. I've gathered 100 top blogs with alexa ranks under 100k in various niches that accept guest posts including all the contact information and social stats, which you can get here. Another method is simply to use the top influencer outreach tool NinjaOutreach; More specifically its Content Prospecting and Social Prospecting. Just run a search using your keyword, and then filter the result with different key pages. Here's where people fall flat on their face. Most people want to make the guest post about them. "Here's what I'd like to write about"
You have the understand the motives for a prominent blogger accepting guest posts on their website. First and foremost, it's delivering quality content that their audience will enjoy. The key here is that it has to be FOR their audience. So, if there's one thing to keep in mind, it's that the guest post idea you pitch should be customized for the person's audience. But how do you know what their audience will enjoy? Find out what they enjoyed in the past. There are several tools available that will show you the most shared articles or pages of a blog. We don't need to go through everyone - one is enough. I recommend QuickSprout's competitor analysis tool. Put in the home page URL. Click on SOCIAL MEDIA ANALYSIS. And after a few minutes it will populate with the top posts by social shares. Now that you have an idea of what their audience will enjoy, you have to find that sweet spot where your expertise overlaps with what the audience wants to read. From this I could see that his audience loves tutorials and tools. Additionally, since it's an SEO blog, I know he has a lot of bloggers who follow him. 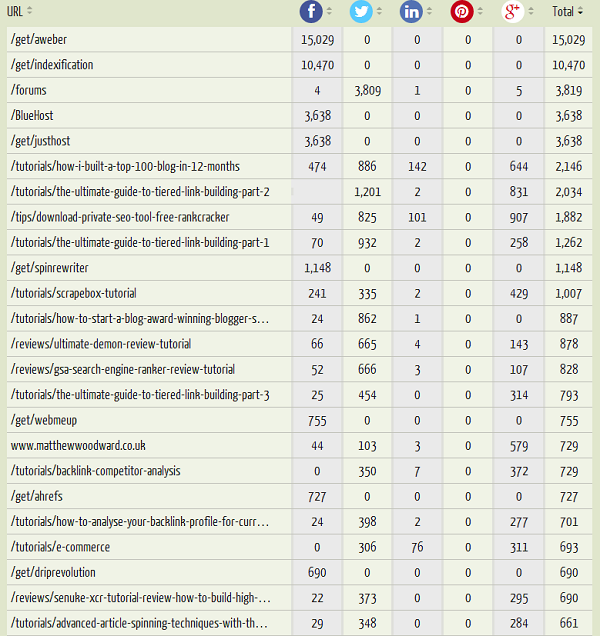 Which was a tutorial on the methods and tools I use to come up with great content ideas, leveraging my own competitors. Did his audience like it? Absolutely, they were destined to. The post was shared 430 times, which even for Matthew is quite a lot, and ranks near the top of the second page out of ten of QuickSprout's analysis. Slow down their tiger - you’re going to want to do a bit of warming up first. Really though, it’s quite simple. Start with a few comments and retweets on recent articles. This will get you on the board. Next subscribe to their newsletter and maybe respond to a few here and there. This show your level of engagement and it’s also a brazen hint that hey, you’re on their newsletter! Finally, look for an opportune time to strike with the pitch. This is another area where people really trip things up. In fact, it was such a sore spot for bloggers Sean Ogle and Ramit Sethi that both of them felt compelled to write posts about how people should pitch them for guest posts (here and here). 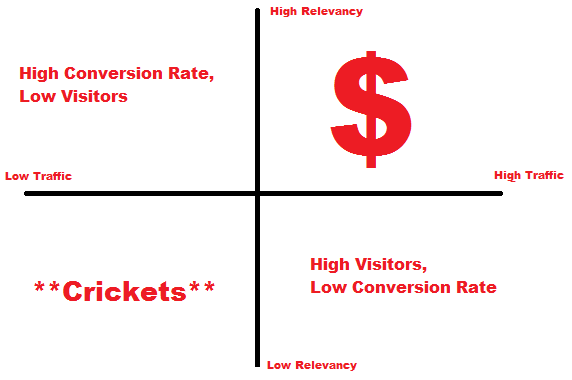 So, before I get into my simple 5 step formula for rocking a guest post pitch, I want to make one thing clear. Above all, if the person has guidelines, follow them. This is why I caution you to always look for the guest post guidelines even if you KNOW they accept guest posts. You might be surprised to learn that people like their eggs cooked differently. While some people prefer to see the post fully written upfront, others simply want the idea and the outline. Thus, it's important to cater to each person's preferences, otherwise you are showing immediately that you really haven't done your research. Now that you've been forewarned, here's my simple 5-step formula. Let's look at each part individually and then we will show it executed in one pitch. Who are you and why do you matter? It's important for the blogger to know that you are a credible resource; their reputation is at stake. You don't need to pull out your entire resume for this one but it's important to establish some form of credibility. Have you guest posted before, if so where? Answers these questions upfront so that they will continue to read the email and not cast you aside as some nobody. In an ideal world you should be able to state your relationship to the blogger. This is where those networking skills Brian was talking about really come into play. You read their blog regularly, but never interact with them. You follow them on social media. You comment on their posts. You subscribe to their newsletter. You talk with them regularly via email or Skype. You have weekly luncheons with their mother and discuss when they're going to finally settle down and marry a nice boy or girl. At a minimum you should have at least one of these to draw from - preferably the luncheons with mom. If you are not on that list, then you have no business guest posting on their blog, and you should consider how you can get on that list (and really, it's pretty easy). At some point, you just have to come out and say what you're there for. It usually goes like this. 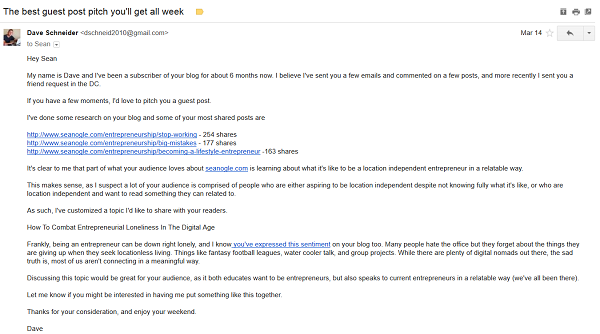 "I'm interested in guest posting on your blog"
I often make this a single line separate from the rest so it stands out. If you've put in the time to research their audience like we talked about before, then all you have to do is draw from that. In fact, I think it works even better to let them know about the research that you've done and show you are serious. Tell them their most shared posts (they might not know) and how that led to your idea. This is where it all comes together and ties into explaining your idea. You have to present the case as to why this is valuable for their audience, because that is what all self-respecting bloggers care about. So here's what it looks like when you put it altogether - this was a recent pitch I sent to Sean Ogle. Next I let him know I would like to guest post on a separate line. You might also have noticed that I added in a bit of a bold subject title. It's a fine line between confidence and arrogance. I did this to get noticed, but I was also confident that I could deliver on that claim. NOTE: Sean and I went back and forth a bit after this and we actually went with a different topic, but he did agree to publish! If you've made it this far you have every reason to believe you are going to get the elusive guest post you've been after. But now you have to actually make something of it. If you don't have the right systems in place you will not get the maximum benefit out of it, and really, it isn't like these opportunities come around everyday. This goes without saying. You have to bring your A-game with this one, especially if you are aiming for the big leagues (as you should). On Boost Your Traffic's Write For Us page they say that an average guest post on their blog takes the writer 20 hours to complete. But you know what - that always leads to quality stuff. Using Custom Images And Videos - Make the guest post pop by using custom made images, screen shots, and flow charts. A picture is worth a thousand words. Be Comprehensive - A picture might be worth a thousand words but it doesn’t replace the three thousand words you should be writing (at a minimum) in order to write a killer, comprehensive guest post. Include Scripts - If your post references any sort of communication, go that extra mile and include the scripts themselves. However, it doesn't just end there - you have to format the post properly. Every blog is different and has their own sense of style. What kind of header tags do they use? How do they box quotations? What size are their images, specifically the width? Did they ask for an author bio and/or an image? If you're not sure about some of these things look at their other posts. Then Right Click, select View Page Source, and find a line that you want to analyze the HTML of. A great way to really show that you've been "a long time follower", which, let's face it, is way overused - is to actually link to old posts from the blogger in your guest post. Everyone knows internal linking is good for SEO and user experience. Therefore, make it easy on the publisher by handling this one for them. Additionally, if there are any affiliate links you know are theirs, put those in too - where appropriate. Once it's posted be sure to reply to all the comments. The blogger will love you for it. Everyone loves comments, and comments beget more comments. 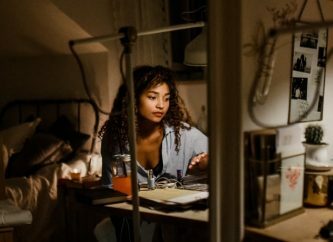 By engaging with their audience you're showing them that this wasn't just a one night stand but that you'll be there when they wake up in the morning. Additionally, it reminds everyone who wrote it. Honestly, you will be surprised how many people do not realize that a post is even a guest post, especially if they are coming to it later. This happens quite frequently when the blogger doesn't do a personal introduction, but instead leaves it to the end of the post in the form of an author bio. Unfortunately, many people don't read all the way through (and more unfortunately, decide to comment anyways). Every comment is another link to your blog out there. It's another path for people to get to your site. Bryan, in his guest post for OKdork, found that by replying to every comment he saw a 523% increase in referral traffic. 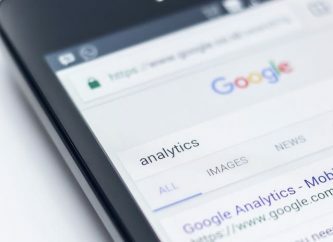 Use UTM parameters inside of your username link in the comment section so you can track the exact number of times that someone visits your site from the comment section. Set Up an IFTTT recipe like this so you get a text every time a comment is left. Reach out via email to each person you mention in your post for additional exposure. All audiences are different and if you want to really capture leads, you're going to want to create a specific offer for that audience. For example, as this site targets bloggers, and this post targets guest posting, I created a special offer of 100 of the top blogs that accept guest posts as well as their contact information and social stats. Building your subscribers is arguably the most important thing you can do as a blogger. You don't just want to send people to your home page where they could easily bounce, but to a customized landing page for capturing leads. Directing them to other posts they might like. This will help you funnel the audience to your best, relevant content and is easily customizable for each guest post. If you land a guest post on top notch blog you can bet it has value beyond the visitors it sends to your blog. Think about the authority you have just established for yourself. Many bloggers put "As Seen On" images on their sidebars showcasing their features. Sure, you might not have been interviewed on Forbes but that doesn't mean these guest posts don't have merit. It's quite easy to find a gig on Fiverr who can put one of these together for you - here's the one I used. Make That Author Bio Count! In many cases your only shot for a link back will be the author bio, so don’t be boring. You do want people to come over after all, and if it reads like “Dave drinks coffee in his spare time” people won’t bother. Give them a reason. 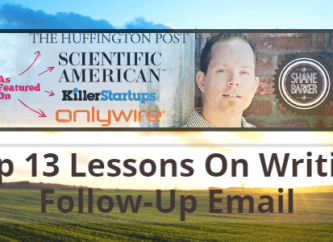 Let me just say this - it's a lot easier to get a second guest post than it is to get a first. Why would you want a second guest post? Just because you did one guest post doesn't mean everyone in the world from that blog's audience saw it. Six months down the line there will be new people who are now following that blog. Additionally there will be people who didn't see it the first time who will now being seeing your latest post. Lastly, there will be people who saw the first post, but for whatever reason didn't fully convert into a follower. In marketing, it often takes multiple impressions to convert a customer - blogging isn't any different. This is why you always (ALWAYS) thank the person for letting you guest post (and why you do all the other considerate things like sharing it with your audience and responding to every comment). Conclusion - What Are You Waiting For? I started my blog in March and have landed guest posts on Matthew Woodward and Fluent In Three Months, as well as two more to be published on Leaving Work Behind and SeanOgle.com. It's not because I'm a better blogger than anyone, or because I bring anything more to the table. It's purely because I searched for opportunities, did the research, and put together a well crafted pitch. There's no reason you can't do it too. Seriously!